The Mammoth Book of Paranormal Romance hits the shelves today*. What do you think of the cover model? 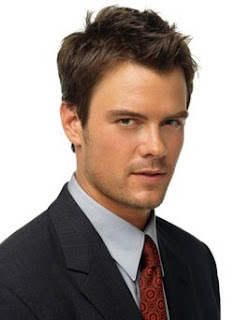 I don't know if Josh Duhamel was the actual model, but he sure is a ringer, eh? *Well, this was the due date. Looks like Amazon started shipping early. Do you already have it? Early reports? I think he looks a little Clark Gable-ish (very young Gable). Too funny. SciFiGuy was just talking about this the other day. He thought the model looked a little like Jude Law.